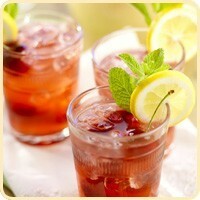 We are expanding our summer drink menu with two different versions of cherry lemonade. Both recipes are non-alcoholic, but if you wanted to add a little rum we won’t tell anyone. Each recipe calls for fresh cherries which are in season right now. These drinks would pair with just about any grilled dishes or simply served alongside your favorite book on a lazy Sunday afternoon.